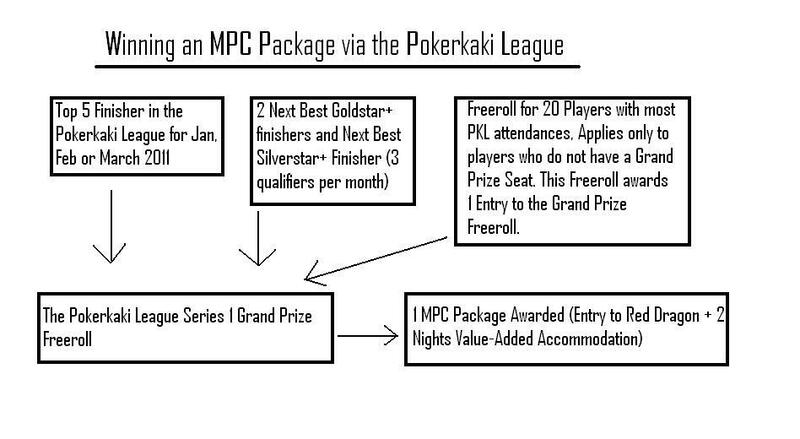 After extensive consultation and feedback, the Pokerkaki League has decided to introduce an additional route to the Grand Prize Freeroll. If you haven't made entry to the Grand Prize Freeroll at the end of March, fret not, because The Top 20 players with the most PKL attendances will be entered into a special Freeroll Qualifier, where they will play for one entry to the Grand Prize Freeroll. Check the graphic above for an illustration. The leaderboard is starting to take shape, with the attractive monthly prizes and coveted Grand Prize Freeroll slots still completely up for grabs! League tournaments run at 930pm and 10pm (GMT+8) every Tuesday, Thursday and Sunday on Pokerstars. Lock in those dates, and you could be in Macau playing for the Red Dragon title, fame, and a boatload of prize-money! Check out www.pokerkaki.com/pkl2012 for all the League details.